Then again, you shouldn’t come out of a Camillo Teti movie thinking that you would have rather really been watching his Cobra Mission 2. That’s just plain crazy talk. 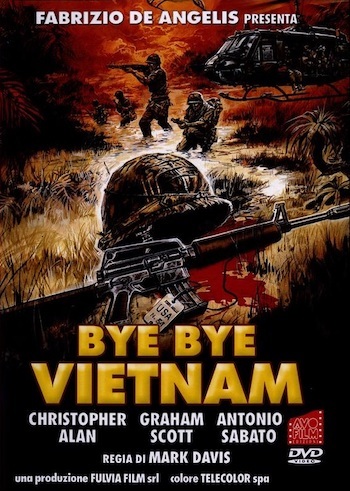 In fact Bye Bye Vietnam is probably the first Nam movie that will trigger post traumatic stress disorder in people who never fought there. It’s the end of the war for our diverse group of heroes. There’s our main character Luke who is dubbed by the guy who dubbed Roger from Cobra Mission 2. Roger and Luke look nothing alike, but since you’ll be spending a good portion of the film resting your eyes, it will feel comfortably familiar to you. The only other halfway familiar presence in this movie is an over-the-hill and obviously inexpensive and underemployed Antonio Sabato who plays Razor, a racist hick from Arkansas who spends most of the movie threatening Sarge, Zulu, and Pee Wee with his knife. When word comes that the helicopter has been shot down and not only are they not getting out right away, but they have to go into the jungle to rescue the pilot, the already surly crew turns really ugly. Lots of swearing, sulking, and half-assed marching into the jungle ensues. Things get tense in a hurry as Luke and the hippie soldier he was paired with wander into a field of land mines. Luke had to cut the wire to one of the mines and then he and the hippie had to dive to safety. It was a real relief when they came away from the incident unscarred. The hippie guy then got shot in the back several times as they were celebrating. That’s the law of the jungle for you. Following a big time attack at their army encampment, the guys find themselves still in the jungle looking for this pilot. With little in the way of explanation they manage to locate the village where the underground hospital is that the pilot is being held at. In a shocking twist that shocks no one who has ever seen these sorts of movies, there’s trouble in the village with a little kid blowing up a soldier with a trick fruit basket as well as more attacks! 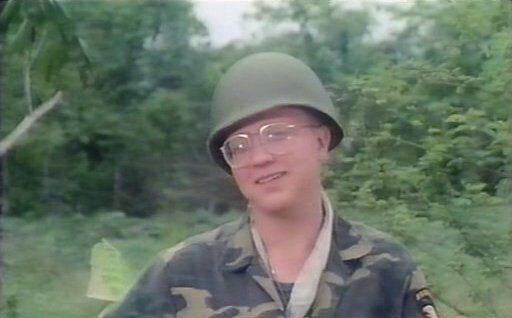 The much put-upon Pee Wee snaps and runs out into the night shooting every Viet Cong guy he can find shouting to Razor “am I still a coward?” over and over. Finally, Pee Wee gets wasted and Razor tells his corpse that yes, he is still a coward. But is that some respect I hear creeping into Razor’s voice? Uh, no, it’s not. Things don’t go any better once they hit the underground hospital. The good news is that they manage to rescue the pilot! The bad news is that the pilot immediately steps on a mine as soon as he walks out of the cave entrance! Demonstrating that we all grieve in our own way, Zulu spits on what’s left of the guy’s corpse and cusses him out as he walks by. The rest of the movie has Zulu, Luke, and Razor hiding behind some logs, shooting at the enemy and dodging mortar attacks. When things seem their bleakest and when Zulu has given up all hope of living, Luke puts his arm around him and they start singing! I’m assuming that this was some type of psychological warfare against the Vietnamese, that their out-of-tune duet would somehow force a retreat by the enemy. I can’t speak for the Vietnamese, but it sure was effective against me! It’s really hard to believe that it could have all gone so wrong. Teaming up producer Fabrizio De Angelis and Teti with writer Dardano Sacchetti to make a movie about Vietnam sounds like a no-brainer. Of course, that’s only because Dardano wrote every Italian junk movie that came out in 1988, penning three for Lamberto Bava (including the extra-egregious Demons III: The Ogre) and five for De Angelis! 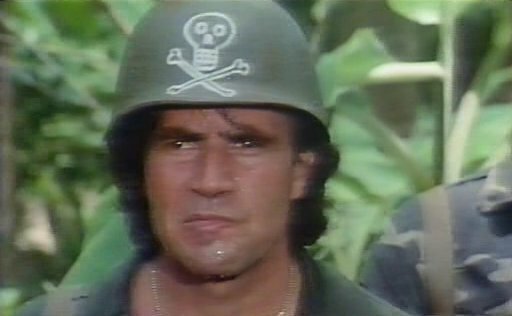 You might take a look at Bye Bye Vietnam‘s dialogue and its exclusive use of swear words and think that maybe Dardano was spreading himself too thin. But then you have moments where the black character named Zulu talks about getting home from the war so he can go back to “stealing cars from Whitey” and you realize that Dardano wasn’t just going through the motions. For his part, Camillo wasn’t slacking either. You could practically feel him getting a hernia trying to squeeze some excitement out of producer Fabrizio’s budget of, um, zero. In most of these Nam movies you at least get to see guard towers, huts and military vehicles get blown up. In this one, the only things I remember get blown up were the ground. To the movie’s credit there was a decent number of explosions, but they just sent clods of dirt and twigs flying. There were also a few times where chunks of guys went flying. While actual property damage may have been severely limited, the number of nameless, forgettable guys getting shot got pretty hefty as the film crept along. Blanks and foreign extras are apparently really cheap. Teti would bounce back several years later in true Italian director fashion though with his Titanic: The Legend Goes On…, an animated film that included talking animals.